A game to help students practise reading and recognising words which have the ow/ou digraph. Print and cut out the cards and you're ready to play! Choose who will go first. The selected person will read their card, i.e. “I have cow” and then reads the question at the bottom i.e. "who has mouse?" 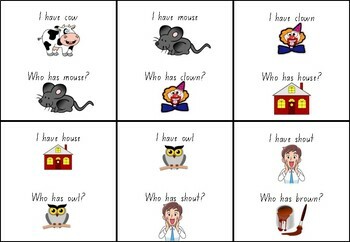 The student with the card that answers the question responds, the person who has the card which starts with "I have mouse". Every card in the set is connected to a card before it and a card after it. Keep playing until all of the cards have been played, the game will end with the same student who started. Each card has an image which is used to help students identifying the words.